BOTTO & BRUNO work as a pair based in a suburb of Turin. Their work relates to inner city youth life and its flux of change. 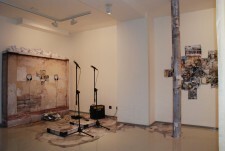 The exhibition entitled ‘A Guitar Plays in a Broken Town’ stems from a short film of two youngsters playing in a public square with a found wooden platform. The London exhibition imagines these youngsters, having now grown up into teenagers playing instead with an electric guitar and some lyrics, as teenagers do. The platform becomes a plinth on a stage for the new band; the backdrop reconstructs fragments of city life with installation photographic collages and fanzines. The act has however finished, the youth has left the square. A live performance for the opening by two teenagers will re-enact this proposal. The lyrics chosen by Botto & Bruno from a list of favourite artists (Cat Power and Sleater Kinney), will be voiced over onto the film with the teenager’s new recordings. They refer to life in the suburbs with its fears, dreams and fragments of life. 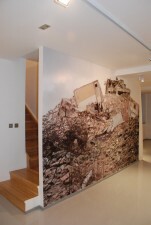 Upstairs, large photographs depict a lone woman in ‘a broken city’, closing the time loop on human growth from childhood to adulthood. Through fragments of songs, photographs and film, the artists poetically transcribe their vision of modern European inner city youth culture into an art context. The exhibition echoes the immediate surroundings of the Soho/Fitzrovia location with its neighbouring record shops.